On May 14, 2014, scientists at Swinburne University in Australia caught a huge high-energy burst of radio waves on CSIRO’s Parkes Radio Telescope in eastern Australia. Called a “fast radio burst”, the signal lasted a few milliseconds, but it gave off as much energy as the sun does in a day, said Daniele Malesani, astrophysicist at the Dark Cosmology Center, University of Copenhagen. Whatever caused the cosmic radio burst must be cataclysmic, huge and at least 5.5 billion light years from Earth, astronomer Emily Petroff of Swinburne University told New Scientist. The study on the fast radio burst was published this week in the Monthly Notices of the Royal Astronomical Society. Fast radio bursts are still a great cosmic mystery. These cosmic radio bursts were first discovered in the Parkes Radio Telescope’s archival data in 2007. It was called the Lorimer burst, and it lasted for only 5 milliseconds. For years, the scientific community debated if the radio bursts were real or a flaw in the data. Since then, seven events have been uncovered in Parkes’ data and in data from the Arecibo Telescope in Puerto Rico. Based on early estimates, scientists believe there could be as many as 10,000 of these radio bursts a day, each lasting only a few milliseconds. No one knows where exactly they come from, or what causes them. Astronomers have postulated that the mystery radio signals come from exploding stars or supernovas. They could also be caused when binary neutron stars or binary white dwarf stars collide. Another possible source of the cosmic radio waves is a phenomenon called a “blitzar.” Blitzars are supermassive neutron stars that should have become a black hole, but they are spinning so fast they are temporarily prevented from collapsing. 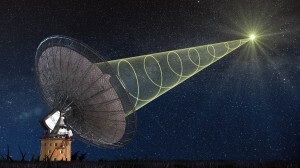 Catching the fast radio burst in real-time did rule out several suspects, Malesani explained in a press release. When the Parkes telescope caught the burst, they alerted 12 other telescopes to take measurements in visible, infrared, X-rays and ultraviolet light. Those observations found nothing, which was important, Malesani said. Petroff and her team are now waiting to catch another burst to get more answers about the phenomenon. “We have set the trap. Now we simply need to hold up for another burst to fall into it,” Petroff said in a release from the Royal Astronomical Society.